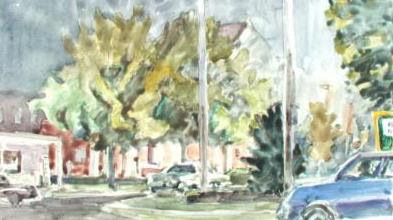 In the late 70’s I did a number of night time watercolors while either sitting in my car or setting up on the sidewalk. I would drive around, looking for unusual effects of night time light and convenient place to pull over. I was often after the “anti-picturesque” — looking for things that would not fit the usual description of a “pretty landscape” but were fascinating to me. I remember pulling into the Stewart’s parking lot on the corner of Broadway and Circular and looking around for a while at the options to paint. I remember liking the way the trees were lit from below, the rhythms of the poles and the light from the now-gone Holiday Inn sign on the far right.